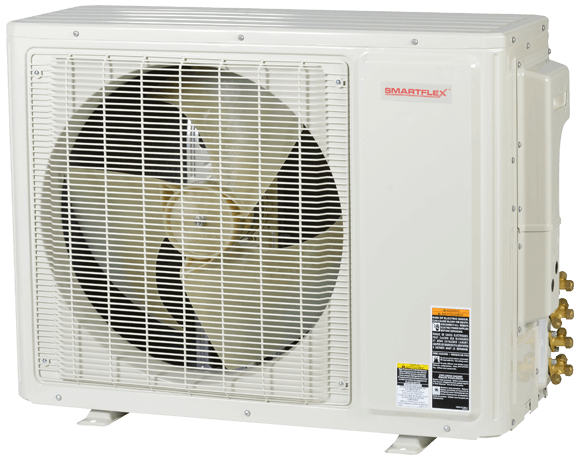 SmartFlex™ Duct-Free Mini-Split Inverter Heat Pump provides both cooling and heating comfort. Advanced technology delivers energy savings and comfort while design provides maximum flexibility in placement and product choice. The Multi-Zone Wall-Mount Unit features a compact design that requires very little wall space, yet it is powerful enough to provide comfort year-round. This whisper-quiet unit can be operated using the standard wireless remote control or an optional wired central or zone controller. 4 Way Ceiling Cassette Unit quietly distributes conditioned air throughout rooms or large, open spaces. It can be easily installed in suspended ceilings and is covered with a discreet decorative discharge grille. This unit can be operated using the standard wireless remote controller or the optional wired zone or wired central controllers. The Ducted Unit offers flexibility and discretion. Concealed above suspended ceilings or within open closet spaces, these units deliver conditioned air through ducting or through grilles in the ceiling or wall. This unit can be operated using the standard wired zone controller or the optional wired central controller. The Floor/Ceiling Unit is designed to be suspended from a ceiling or mounted low on a wall near the floor. The compact design is perfect for spaces where wall space is limited. Slim and unobtrusive, these units are a great fit beneath windows. This unit can be operated using the standard wireless remote controller, or the optional wired zone or wired central controller. Wired controller Comfortable sleep mode.